The FJP's executive office warns against the obstacles deliberately put in the way of Egypt's transition to democracy. These obstacles affect the public interest and the public's desire for stability and a better future, which will obliterate the negative effects left by the former regime and which still has remnants trying to harm the public interest. This can be seen in the fuel and cooking gas shortage, which has shown up the government's failure to resolve these problems or find ways to prevent attempts to hijack the Egyptian revolution and return the same regime to power. This only bolsters our belief that the current government, which has given nothing to the Egyptian people except problems in all fields, must go. The FJP's executive office puts full responsibility on the ruling Supreme Council of the Armed Forces (SCAF), which currently enjoys executive authority, for the increasingly negative effects of this government, which both creates problems for the coming government and presents a danger to the revolution and its goals. The FJP's executive office confirms that the Egyptian people, who gave their confidence to both elected houses of parliament, will not leave this parliament to be politically blackmailed into taking political and economic decisions that do not meet the aspirations of the Egyptian people. Perhaps the parliament’s clear attempts to fight corruption, which the old regime planted in all of the nation’s institutions, have worried the symbols of this corruption and threatened their influence and led them to find ways of creating obstacles. What the government itself discovered regarding the responsibility of the father-in-law of Mubarak’s son for the current petrol and diesel crisis is evidence of this. This makes us wonder how officials can leave the symbols of the old regime in their positions until now without taking any steps to protect the nation and respond to its ambitions. The FJP's executive office followed the steps taken in the presidential elections until now and the problems reported made us worry about the transparency of elections and the possibility of it being rigged in the favour of a particular candidate who some may want to force on the Egyptian people. We confirm that the people who launched the revolution and participated in elections for both parliament and the Shura Council will not allow elections to be rigged again or have anything forced upon them, whether an opinion or a candidate. The FJP's executive office is still studying its options in terms of presidential candidates. 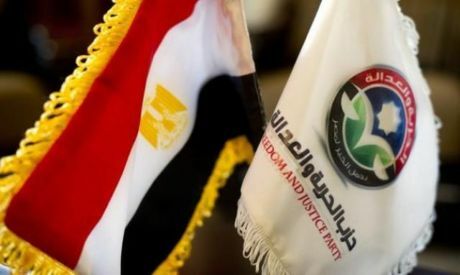 Specialised authorities within the party are studying suggestions to field one of the leaders of the FJP or the Muslim Brotherhood in the presidential elections in light of the many recent changes in the internal and external political landscape. When a final decision is made in this regard, it will be announced to the public. The FJP's executive office criticises the performance of several media outlets owned by businessmen who are symbols of the old regime, which have worked to promote division among the Egyptian people, while adopting the slogans of the revolution as cover. However, the people, who saw them as they praised the old regime, still remember their tears for the ousted president after his speech on 1 February 2011, when he tried to deceive the Egyptian people. But God exposed them and their fake tears on the morning of 2 February 2011 with the Battle of the Camel. These converts are known by the Egyptian people and their goal is to put all their money – the sources of which should be investigated – into defaming the Egyptian revolution, spreading chaos, and derailing the gains that the Egyptian people have achieved until now. The FJP's executive office stresses that the candidates presented by the houses of parliament to the party in the parliament and Shura Council for membership in the constituent assembly to draft the constitution includes all factions, ideologies and institutions. This was done to ensure that the new constitution enjoys the consensus of everyone and responds to the demands of all factions of the Egyptian people. This was confirmed in the results announced at dawn today which showed that the constituent assembly includes all political parties and representatives of syndicates, authorities and various NGOs, as well as religious institutions, both Muslim and Christian, artists, authors, journalists, workers, farmers and prominent public figures. The constituent assembly does not show a preference for the FJP as some have claimed.